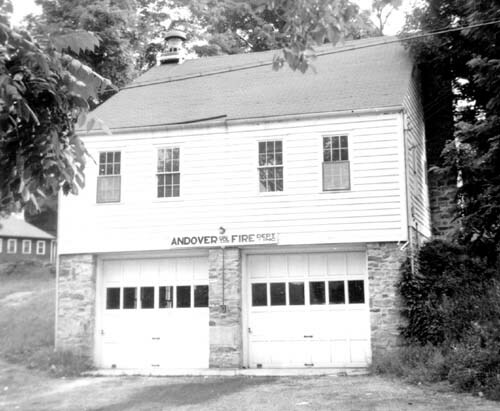 Early in the fall of 1937, residents of Andover were awakened by the fire signal on their telephone. Answering the alarm, they were informed that a house was on fire and that aid was needed. Upon arrival at the house, a relatively small fire was observed in the basement. However, there was no water available and no fire fighting equipment in town. As a result, the fire spread and the house was completely destroyed. The Coventry Fire Department arrived after some time and were able to save the adjoining garage. It was apparent to the early arrivals at this scene that the fire could have been easily extinguished with only minimal damage to the house if proper fire fighting equipment had been available quickly. As a result of this loss, the Annual Town Meeting of October 7, 1937 appointed a committee to study the feasibility of, and need for fire protection for the town. The committee, composed of Bertram C. Wright, Charles W. Phelps and John H. Yeomans, was to report back at a future meeting. Prior to making their report to the town, the committee called a meeting of townspeople to discuss the possible formation of a volunteer fire department association. At this meeting, held in February, 1938, it was decided to organize and the following officers were elected; Bertram C. Wright, President, L. B. Whitcomb, Vice President, Ellsworth Covell, Secretary, Arnold Hyatt, Treasurer, George A. Merritt, Chief, George S. Nelson, Deputy Chief. Soon after, this new organization voted to adopt the name "ANDOVER VOLUNTEER FIRE DEPARTMENT." Quickly the attention of the membership turned to the securing of equipment and a place to store it. It was decided that the old Sackett's store building was the best place, of those considered, for use as a firehouse. The Sackett place had an asking price of $1200, but it was felt that it could be purchased for $1000. At the May, 1938 Town Meeting, the study committee made its presentation. They had charts showing the cost of past fires and estimates of the reduced insurance rates that everyone would pay if an equipped fire department were active in town. Upon the recommendation of the study committee, the town meeting approved an appropriation of $5,000 for the purchase of a fire truck and $2,000 to provide housing for it. As a result, the Sackett property was purchased for $1,000 and remodeling plans began to take shape. Also, a contract was signed with the Maxim Company to provide Andover with its first fire engine. The truck would carry 150 gallons of water, 1,200 feet of 2 1/2 inch hose and 300 feet of 1 1/2 inch hose. It was built on a 1 1/2 ton Ford chassis and cost $4,766. 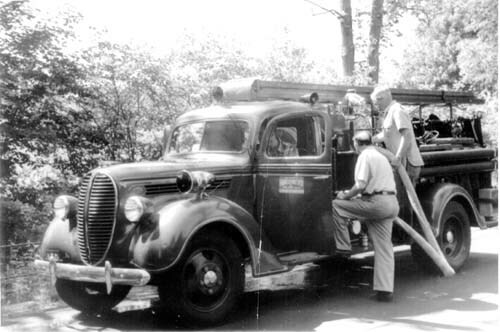 Early in January, 1939 the new fire siren rang and soon the recently delivered Maxim fire engine was responding to its first fire. A garage standing at the intersection of Route # 6 and Bunker Hill Road had been set afire by a truck backfire. The fire was knocked down and close to out when the engine ran out of water. The men tried to get water from a nearby well, but it was too deep. Chief Merritt ordered the truck to lay hose to the Hop River. Once the Engine began pumping from the river the fire was quickly extinguished. The truck and the garage were both a total lost. In the spring of 1940, the department was able to move into the freshly remodeled fire house. While the old store was being converted into a fire house, the engine was kept in Mr. Goodale's garage, the siren was mounted on Mr. Yeomans' garage and the meetings were held in the town hall. In the summer of 1948, it was decided that Andover had to have more water on wheels to supplement the 150 gallons carried by the engine. As it happened, the Radcliff Oil Company had several used Oil Tank Trucks for sale. A committee was dispatched to look at these trucks. It reported back to the department that one would be suitable for meeting our needs as a water tanker. A special meeting approved the purchase of a 1941 chassis and tank. They also approved the purchase of a centrifugal pump, booster reel and related plumbing. The total price was $1,200. Since this purchase, the department has put into service 6 more full sized fire trucks, the newest of which cost $202,000. Many smaller rescue and utility vehicles have served Andover as well. Andover's first true ambulance was purchased in 1969. It was a used 1965 S & S Cadillac that had originally been used in the town of Bethel, Connecticut. At the present time, the fire department is on its fourth such vehicle. In 1955, the first of three major additions to the fire house was undertaken. That spring, using $1,500 and lots of volunteer labor, the downstairs garage area was enlarged to include a third bay. In the summer of 1971, another addition was started with a $12,000 appropriation from the town. This project added considerable depth to the building, both upstairs and down. Again, the firemen provided most of the labor. The fall of 1982 saw the completion of the last expansion of the old fire house. In that year, using mostly donated materials and as before, volunteer labor, another large truck bay was added to the building. In 1986, the Board of Fire Commissioners created a Fire House Study Committee. This committee was charged with studying the needs of the department, the condition and expandability of the current fire house and the necessity and/or feasibility of building a new building. They recommended that the town be asked to build a new Public Safety Complex to house the Fire Department, Police and Civil Preparedness activities. 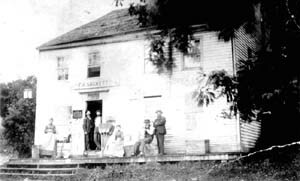 The study committee was then appointed a town building committee. This committee brought to the town a scaled back plan that called for the building of a fire house only. The result is the new fire complex on School Road. It was opened 1990. E. K. Seyd and George Nelson give the Maxim a workout.